'Aasmano Pe Likha' is an Upcoming Rishtey Tv Serial which is going live from next month in June 2015 on Rishtey Hindi Entertainment Tv Channel. This show is directed by Mohsin Mirza. The story of the show is written by Rabia Razzaque . 'Aasmano Pe Likha' show is produced by Asif Raja Mir. Sajal Ali & Emmad Irfani plays lead role in this show. This show is 1 of the most popular shows on Pakistan. In Pakistan this show was aired on Geo Tv with the title of "Aasmano Pe Likha".This show achieve highest TRP in Pakistan but Later, After launching a new show 'Khel Kismat Ka' this show loses his popularity. Now Rishtey Tv is ready to Launch this show in India with the Same in next month. 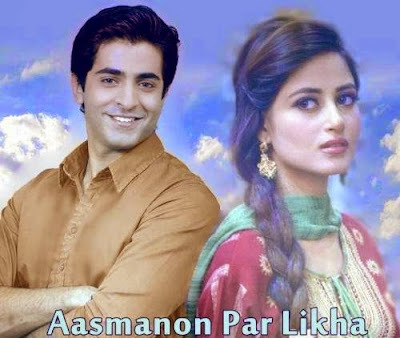 Aasmano Pe Likha Upcoming Rishtey Tv Serial story sounds very filmy where a poor girl Qudisya (played by Sajal Ali) gets married to Aaliyan accidentally (played by Sheharyar Munawwar) when her in laws called off the wedding because Qudsiya’s parents fail to fulfill their dowry requirements. Aaliyan who is guilty of not passing the loan for Qudsiya’s father, steps ahead to help the poor family at the need of hour and marries Qudsiya. This sympathy apparently doesn’t work too well for Qudsiya since she is now sandwiched between Aaliyan’s family who are not ready to accept her as their daughter-in-law and her family who wants her to stay with her husband only because of the poor health condition of her father. Sajjal Ali , Emmad Irfani and Sheharyar Munawar are Playing Lead role in this Pakistani Tv Serial. We are sharing Title song of "Aasmano Pe Likha" Upcoming Rishtey Tv Serial.